What’s happening in Lebak Bulus? 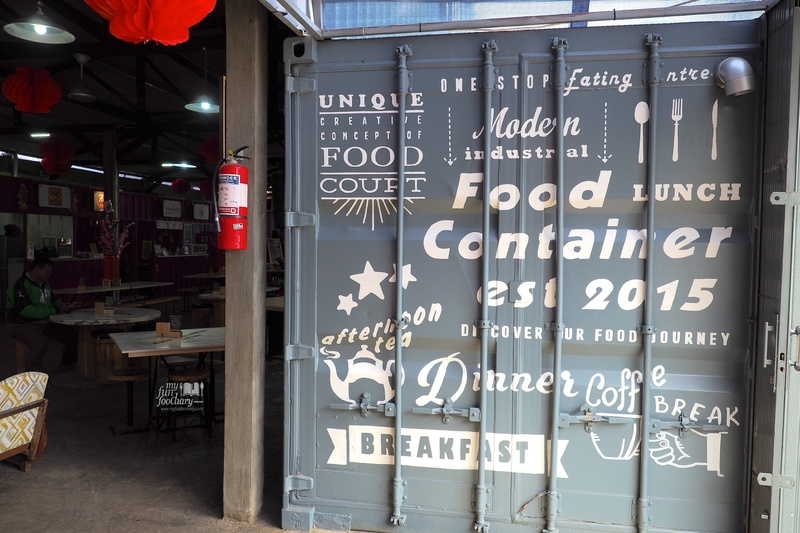 The Food Container, a modern industrial food court is the latest opening that’s fast becoming a foodie destination lately. I could not join the Grand Opening event which held before the Lunar New Year (Imlek), so we decided to visit this place a few days ago. There are 24 tenants at this time, and we managed to sample most of them. Ranging from a few brands that often appear in the bazaar such as Kelasi, Ichitori, Ultradon, up to the western and traditional food, such as Nasi Kentjana, Bebek Pedrik, The Cendol’o, Pipa Bread, Martabak Dunia, American Corner, Pempek Kita, Pasta Kangen, Gritology, and Better Life Coffee Bar. 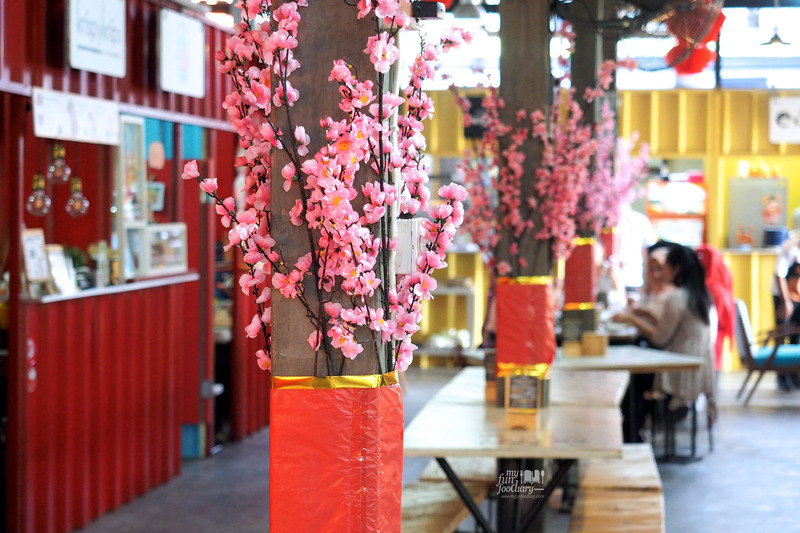 Although it’s a food court, they’re quite different than some other food courts. 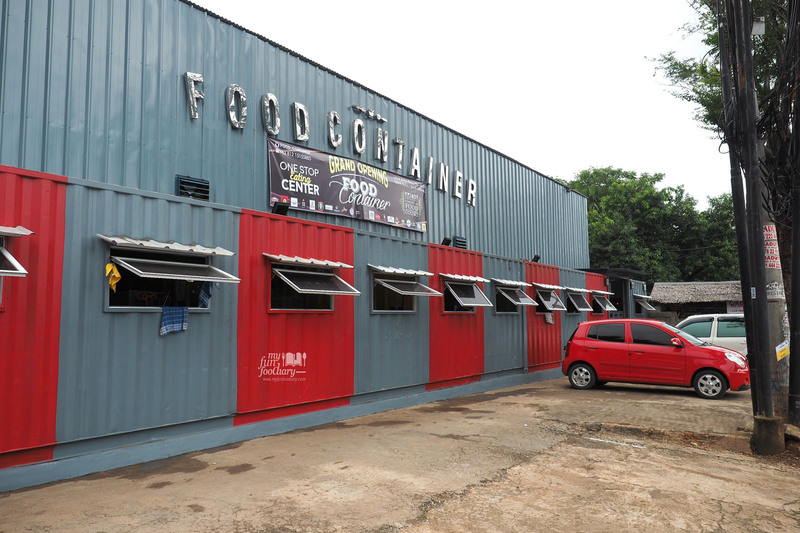 Here, Food Container provides servers so that customer can sit, relax, and order food directly from their table. Food Container is nicely set up though the atmosphere may feel warm during daytime. However, the variety of dishes allows one to sample many different dishes, the service was good, and we all enjoyed the food. And one other thing which is also important, reasonable prices for food and drinks provided. If you are craving for savory fish cakes (pempek), you can try Tekwan (IDR 25K) and Pempek Lenggang (IDR 25K) from Pempek Kita. From the Indonesian food section, we enjoyed the Nasi Uduk Bebek (IDR 33K) from Bebek Pedrik, and Nasi Kuning Cakalang (IDR30K) from Nasi Kentjana Express. The fried duck was tender, served with lalapan and sambal terasi which gives a nice addition to the duck. All the condiments such as anchovy with peanuts (teri kacang), shredded omelette, tempe orek, etc which complement Yellow Rice Cakalang also tasted delicious. If you are looking for pizza and a fan of sweet spicy and salty flavors, Crispy Pizza Daging Selingkuhan (IDR 27K) from Pasta Kangen could be for you. The American Corner serves a variety of burger, but we only tried the BBQ Hotdog (IDR 25K) which was quite big in size and tasted good too. I’ve also tried Hanabi-yaki (IDR 45K), a new variant from Ichitori; tender and spicy chicken karaage served with onigiri and crackers. If you want something sweet, try the Sweet Pipa where the Nutella almond covered the bread that comes in a pipe shape, served with cotton candy and ice cream (IDR 29K). I’ve seen Ultradon Rice Bowl Specialist many times in social media feed, and finally had a chance to find them at the Food Container. Both Gyudon (using prime US beef slices, IDR 45K) and Gyutan Don (using prime US beef tongue, IDR 45K) were beautifully presented, tasted good, and if you like, you can add fried egg and select the level of spiciness to suit your preference. And not only that, but I’ve also found something unique here. 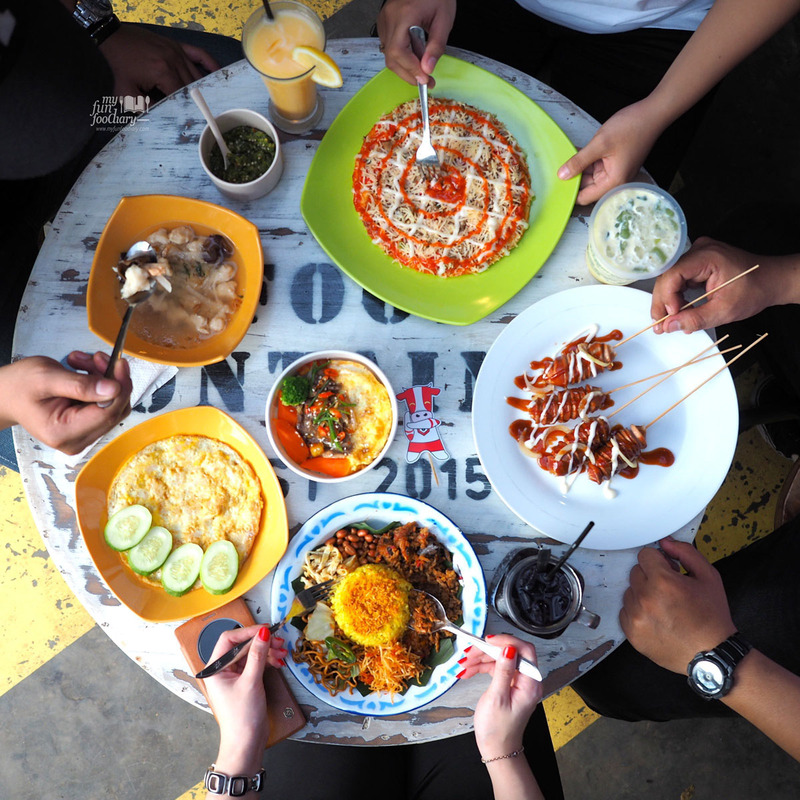 If you ever want a pizza and to eat martabak at the same time, try to visit Martabak Dunia at the Food Container. We’ve tried one of their favorite menus, called Martabak Bolognese (IDR 100K) where the original martabak served with bolognese sauce and lots of cheese on top. Sinful, yet it tasted delicious! The Kebuli Beef Rice (IDR 40K) which is a kind of middle eastern food made by Gritology easily pleased my taste buds. For the drink, you can also find a variety of coffee from Better Life Coffee. We had a Caramel Macchiato (IDR 32K) and Caramel Frappuccino (IDR 35K), and both of them had a sweet ending that is suitable for all the sweet tooth out there. It’s true that no matter how full we are, there’s always room for dessert, like what we had that day. Our favorite coconut dessert where a variety of ice cream flavors served with different toppings and presented in a coconut bowl from Kelasi (starts from IDR 30K), and DurMil’O (Durian, Milk Shake, and Cendol, IDR 25K) from The Cendol’O are the kind of dessert you shouldn’t miss when you visit the Food Container. Overall, if you want to grab a meal while you are in Lebak Bulus area or not sure what you want for lunch or dinner, stop by at the Food Container and see what’s inside. There are so many options, so do not worry! Bring your friends, family, and colleagues, you won’t leave hungry when you’re here!